Ever heard of the Las Vegas Market? Now’s your chance to get an inside scoop on what goes on behind the curtains of one of the world’s largest bedding, furniture, and decor conferences! 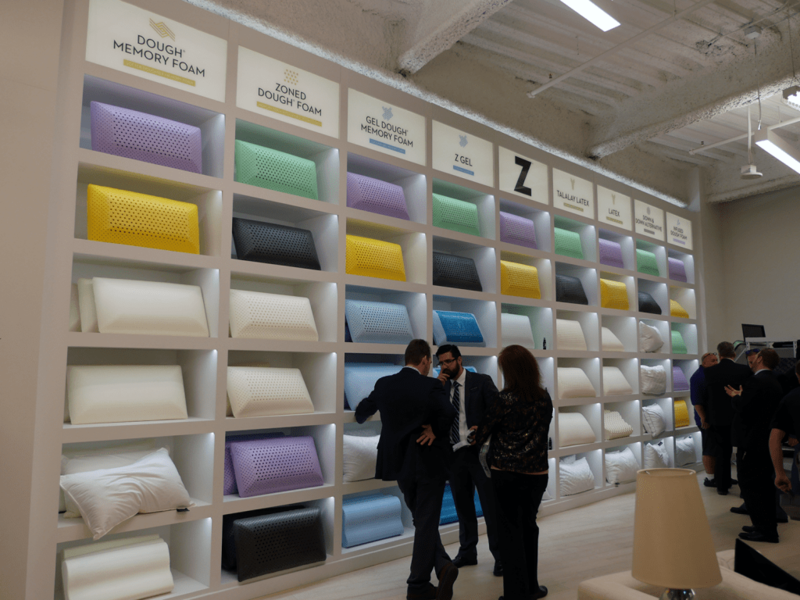 Last week, I had the opportunity to travel to Las Vegas, Nevada and spend 3 days speaking with some of the largest bedding companies (online & offline) in the world and came across some interesting new products. Intrigued by what we were able to see and hear about? Keep reading below to check out some of the newest sleep products coming this year! What is the Las Vegas Market? 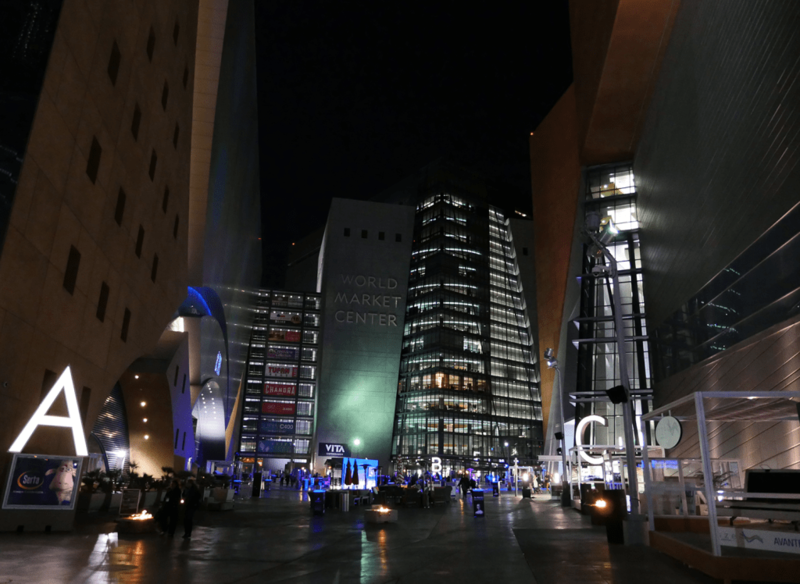 Las Vegas Market is one of the world’s largest mattress, bedding, furniture, and decor conferences in the world. I spent a total of 3 days exploring 3 buildings with a combined total of 9 floors of mattresses and bedding products. These floors each had anywhere from 12-15 companies looking to showcase their newest and most impressive products to date. Needless to say, I have plenty of new products to show you all! No need to worry, Sleepopolis plans on testing and reviewing many of these products this year. Stay tuned for fully comprehensive reviews of the most interesting new mattresses and bedding accessories. BedGear is known for their high performance bedding technology and this year, they have decided to release their newest performance blankets and travel pillows. Both of these products are unique in their own way. The blankets have a sleek and cool style. They are built using material similar to that in performance sportswear. 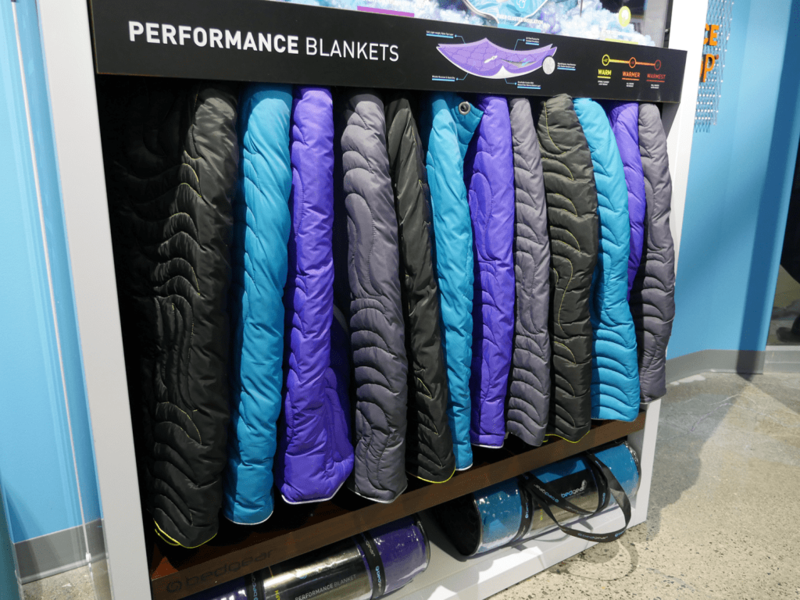 BedGear will be officially launching these blankets later this year and they will be available in 3 different levels of warmth and a variety of colors. The travel pillow in one word, wow! Simply one of the coolest products I have seen to date. Sleeping on a long flight or car ride can often be extremely difficult without a nice pillow. BedGear has finally designed a travel pillow that checks off support, moldability, and the ability to fill gaps (between head / neck and windows) all with one small pillow. The Bedgear travel pillow will be launching later this year. There’s no shortage of sleep trackers available, but thus far none of them have really intrigued me. The Sleepace sleep monitor is the first that may be able to deliver on true sleep analytics. The Sleepace simply slides under the sheets, so no need to worry about wearing a tracking on your wrist or body somewhere. It runs on a standard lithium ion battery that lasts for around 30 days on a single charge. 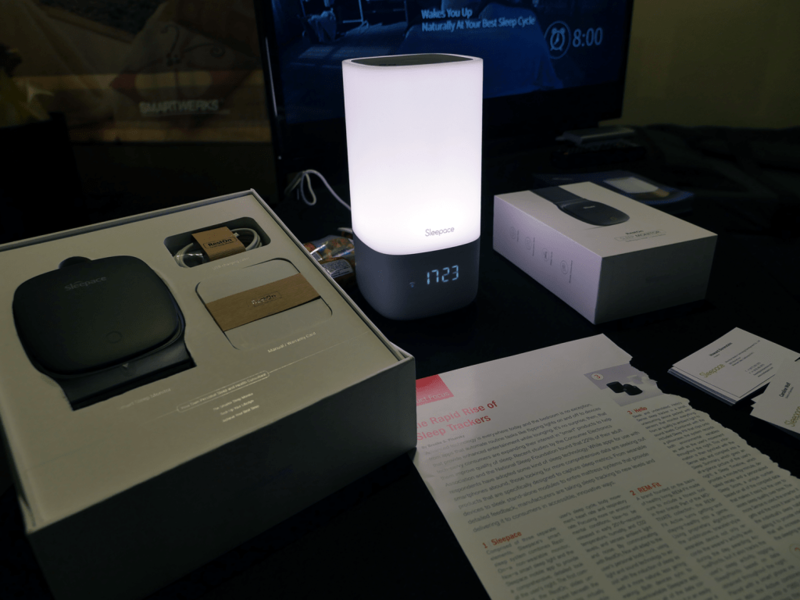 In addition, in just a few months, Sleepace will be releasing their new Smart Sleep Light. This light has a plethora of unique features, including the natural wake light, personalized sleep sounds, humidity, light, sound tracking, and more. The smart alarm light will integrate with the Sleepace tracker. Several months ago I tested the Forever Foundations Metro foundation. It’s an all steel platform bed with lots of storage. In just a few months Forever Foundations will be releasing their brand new foundation accessories. Sleepers will now have the option of adding power outlets, motion activated lights, and most importantly, storage bins. The Forever Foundations were already a good option for storage and having the hangable storage bins just makes them that much better. Malouf had quite the showcase at the Las Vegas Market. Their most unique new product, scented pillows offered in varying colors & scents. Having previously tested several Malouf products, I would expect quality construction and performance from these pillows. I’ll definitely be testing one or more of these pillows later in the year. Have you ever seen a fitted sheet that can be forcefully pulled from the top of the mattress and not slide off? Well, here you go! DreamFit not only created 6 different sets of sheets all made from high quality material, they also set the bar for fitted sheets that remain tightly fitted around your mattress no matter what. An extremely durable elastic band and 4 cross-corner bands help to ensure your fitted sheet goes on easy and stays on. 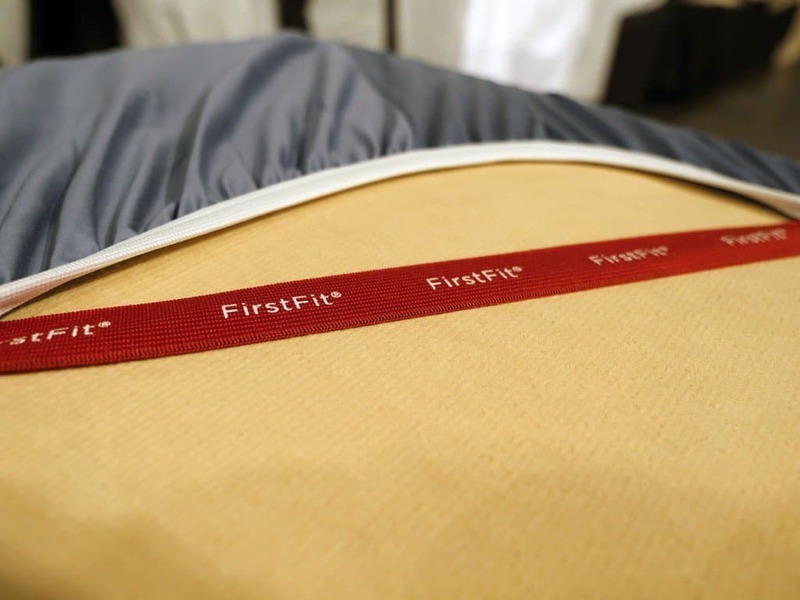 Most of DreamFit’s sheet line is already available on Amazon. Technogel was one of the most interesting products I saw while attending the market. 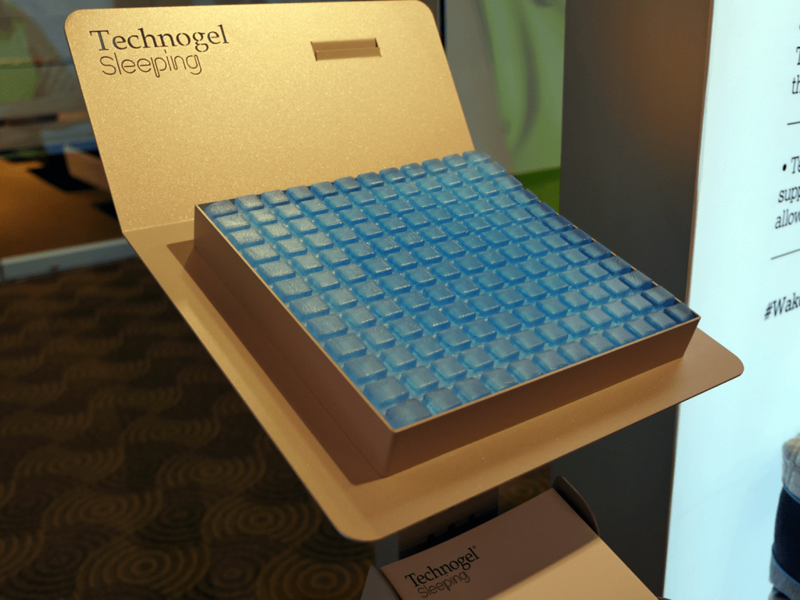 Technogel has placed their gel product within their mattresses, pillows, seat cushions, and kitchen mats. This gel contains no volatile agents, allowing it to maintain its gel cooling and comfort properties for a long time. To sum up the Technogel, it is extremely durable, deforms in 3 directions instead of sinking down, reduces pressure points, and helps maintain thermal regulation. Technogel pillows are available online, but you’ll have to find a local retailer to order their mattress. Dormeo is a company looking to mix up the hybrid mattress design. Instead of the traditional spring coils, Dormeo has brought foam coils to the market. They have designed their mattress with layers of foams on top of, and below, foam coils. 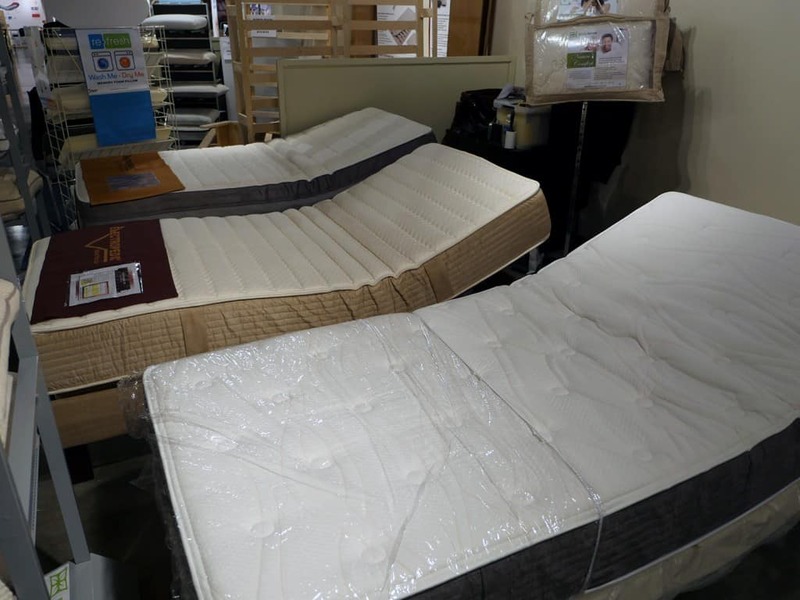 These coils can be made in varying levels of firmness, giving sleepers the option to select how firm they would like their mattress to be. The emBrace frame is one of the easiest frames I have assembled yet. Out of the box, this guy takes ~2 minutes to assemble. It comes in a total of 5 pieces that all slide into place without any tools. Not to mention the emBrace frame is extremely durable as it is made from double wrapped recycled railroad track. With that said, the emBrace is not extremely heavy, and does a great job of supporting any foundation / mattress. 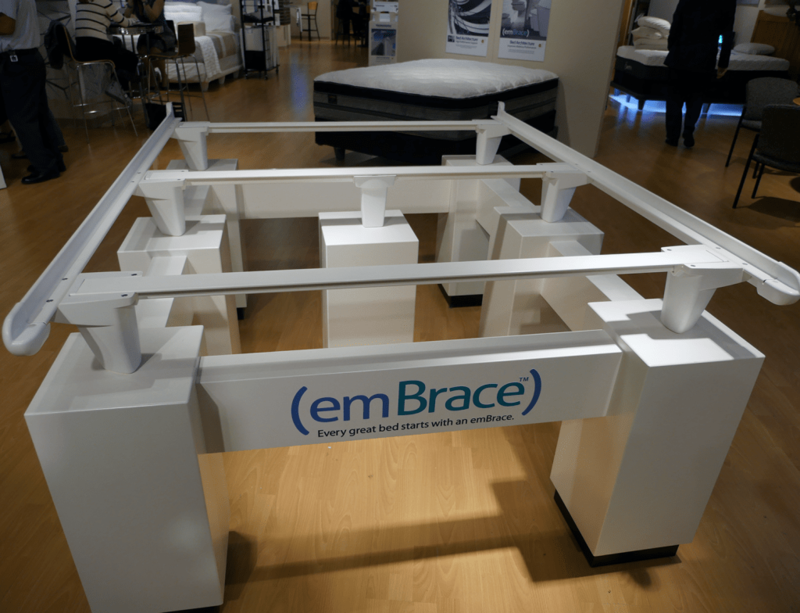 Electropedic has created an adjustable foundation designed to fit the needs of most sleepers. 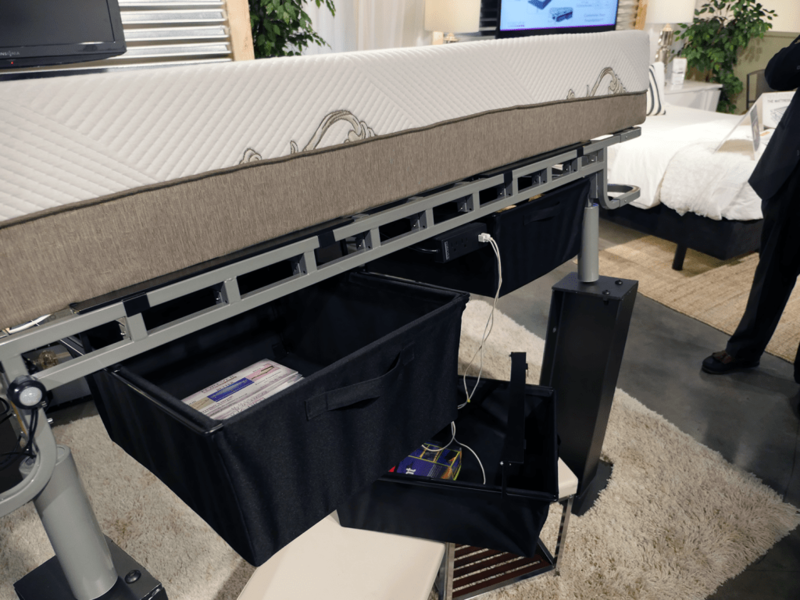 Whether you’re having back pains, need to sleep upright, or enjoy lying in bed with your feet up Electropedic has you covered. Adjustable foundations are by no means a new innovation, but the price point and feature set of these is on point. Have you reviewed the Dormeo mattress yet? Costco is selling them online now, so I imagine there are a lot of people asking looking for reviews. Not yet, but it’s one I am hoping to get within the next couple of months. Any updates on the Dormeo mattress? I recently purchased it from Costco instead of the Saatva. I wanted to buy the Saatva but in the end it was the cost and Costco’s unconditional return policy which made be buy the Dormeo. I value your opinion and review so please let me know when you’ll be reviewing the Dormeo. Unfortunately I haven’t tested the Dormeo yet…it’s been on my list for a long time, but a bit further down as I haven’t had as many requests for it. I will see if I can get it a bit sooner though. Perhaps this summer. I know this original post is old, but I am hoping a review is coming soon on the Dormeo? We are debating between the Dormeo Octaspring 5800 or the Novartis (medium). While I can find plenty of reviews online for Novartis, I can’t seem to find much in the way of North American reviews of Dormeo. Which seems odd? The Dormeo is double the cost of Novartis so we are wondering if the price is really worth it? Oh I want a mattress with that gel in it. I think the Intelli-Bed is kinda like that. I will probably have to wait for the patents to run out before I can get one. It’s very similar as well. I’m needing 2 mattresses for college age guys. I don’t want to pay a lot of money but what something that is good and comfortable. I looked at your amazon recommendations. What would you suggest? Also, Amazon offers platforms that are real inexpensive. Are any of these good? To make sure I’m providing you with the best recommendations, would you mind emailing me here https://sleepopolis.com/contact/ There are a few other questions I would like to ask before making a recommendation. Presently I own a Satava firm queen mattress. Still having a problem with a little back pain. Looking at the loom and leaf mattress. Have not tried foam before but think I’m ready for a try, any advice ? Step 1 – go to your local mattress store and lie on some foam mattresses to at least give yourself an idea if you like that feel at all. Some people love it, others hate it, it’s a very personal decision. Check out some of the Tempur-pedic Cloud mattresses. Loom & Leaf is similar’ish to the Cloud Supreme. Thanks for your reply….would you say that one (Leesa or Hyphen), sleeps cooler than the other? Between these two, I would not say one sleeps cooler than the other. Both do a great job of maintaining a cool sleeping surface. what are thoughts on Bear vs. Purple? My wife prefers a bit softer like a Tempurpedic, but I prefer firmer. We tried twinXl’s to have individual firmness, but determined we prefer one king because of the crack in the middle…we liked both of your reviews on the Bear and Purple, particularly the cooling effect on the Bear. Is the Bear that much cooler than the Purple? Both are very good choices. The difference boils down to what type of feel you’re looking for. The Purple is going to offer more of a floating feel whereas the Bear will allow you to sink into the mattress somewhat. If your wife is a lighter sleeper, the Bear is going to be the more appropriate option. Lighter sleepers tend to find the Purple too firm. Therefore, it depends on your body types and weights in addition to what type of feel you’d like to sleep on. I have a beautiful solid oak bed with headboard, footboard and wooden side rails. Would an adjustable bed frame fit inside the existing bed? To be completely honest, this is a tough question for me to answer. The easiest way to find out would be to email the company making the adjustable bed you’re interested in and obtain their specs. Following that, take come measurements of your current bed and decide whether or not the adjustable base will actually fit. I apologize for not providing you with an exact answer, but I do not want to speak for a product that I have no personal experience with. Hubby and I are trying to narrow down our choice for a new mattress. We’ve pretty much narrowed it down between the Leesa, and the Hyphen. I don’t see that you’ve done a head to head comparison on these two. Any thoughts? Thanks! Both are very good choices. The main difference boils down to overall performance and a slight difference in feel. With regards to performance, I found that the Leesa performed slightly better in most areas. By no means is the Hyphen a bad choice or low quality mattress, I just tend to lean a bit more towards Leesa personally. Additionally, the feel of the Hyphen is a touch different. While lying opn the Hyphen I felt as if the sinkage was more defined and provided more of a pronounced hug compared to the Leesa. I’m debating between the Leesa, Saatva or Loom & Leaf. I currently have a very heavy king mattress that will need to be hauled away. From what I can see, Leesa will not remove the current mattress but the other 2 will. Is that correct or did I miss something on the Leesa site? Also, I’m older now and am having trouble lifting the mattress to tuck in sheets. Could you give me the weight of each mattress? I would get the thinner king, not the 14.5 like I currently have. Each of these are great for different reasons. With that said, I do believe either Saatva or Loom & Leaf would be the better choice due to your current situation. Both Loom & Leaf and Saatva will take away your current mattress for a small fee. Now deciding between these two boils down to the type of feel you’re looking for. If you’d like more of a traditional feel, the Loom & Leaf is the mattress for you. On the other hand, if you enjoy a quicker response time in addition to a higher level of bounce, the Saatva is the route you should take. If your current slats are providing good support, no reason to change. In any case, it would be good to try the new mattress before making a decision. Leesa is still my overall favorite pick and the best value of any mattress I have tested to date. However, there are several others that I would consider top tier in terms of performance, including: Loom & Leaf, Purple, Nest Alexander Hybrid, and the Saatva. Brooklyn Bedding, Ghostbed, and Helix are also up there depending on budget / needs. Hi. Do you know if the Electropedic adjustable foundation is or will be offered in a split King style? Also can you put a single mattress on it, like the Leesa, or is a base mattress required? Thanks! Yes, they are offered in split King style. You should be able to put a mattress directly on it. Though it would need to be a Twin XL for the Split King (to get the length right). Where do I buy your t-shirts? Do you have any commemrative/collectible mugs? If not can I make them for myself?